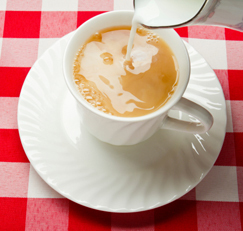 Does Milk Hurt the Health Benefits of Tea? Depending on your particular culture and taste, adding milk to your tea may be common or unusual. But that tiny, seemingly insignificant decision may impact your health more than you might think. You may recall that a 2007 study found that using cow’s milk in black tea may cancel out some of the tea’s key health benefits. Well now, another study—this one from 2012—shows that adding cow’s milk or even soy milk to green tea may also have a negative effect on health. The earlier study that tackled this topic looked specifically at the effect of cow’s milk on black tea. Researchers found that drinking black tea—without milk—significantly increased the ability of the subjects’ arteries to accommodate changes in blood flow. But this beneficial effect was not seen at all in either the control group (that drank boiled water) or the tea-with-milk group. In other words, drinking the tea with milk completely prevented the subjects from getting this particular cardiovascular benefit from the tea. How come? Tea contains catechins, compounds that help blood vessels relax. Milk, however, contains proteins known as caseins that can inhibit this benefit of tea, probably by combining with the catechins. This is true of all types of cow’s milk, regardless of the fat content. Talk about udder disappointment! WHAT ABOUT SOY MILK? AND GREEN TEA? Another more recent study was performed, by a separate set of scientists, to see whether soy milk would blunt key health benefits of green tea. Unfortunately, it did! Those researchers found that when subjects drank green tea with soy milk or with cow’s milk, both types of milk reduced the bioavailability of certain catechins, compared with drinking the green tea with no milk (the control). When bioavailability is reduced, the body can’t absorb as many of the beneficial compounds. Source: Mario Lorenz, PhD, senior scientist, department of cardiology and angiology, Charité Medical University, Berlin, Germany.